If you are using WordPress to publish multiple pages of content for you viewers, then you will want to use Categories. WordPress uses the category option in order to provide organization for your content. In turn, providing this organization helps your users find similar or other content within your WordPress site. Use categories to create a hierarchy of your content and the organization will also help make your website easy to navigate. Creating order with categories helps to improve your search engine rankings and promote a better overall user experience. Putting your content into categories can involve using a single category or multiple categories. In general, although it may help to promote awareness to content, using narrow definitions for content keeps it orderly. Using broad definitions may also work, but it depends on your website content, your needs, and tastes. Let's say that you create an article about "DSLR Photography"
Your subject category can be "photography", but depending on your website content, that may be too broad. You would need to go into your article content and try to come up with a major theme of the content. The content might be referring to a specific brand, but if you have twenty articles or posts about a specific brand, then creating the category to bring traffic to the article will need to relate to specific content within the article. For example, the article title could be "Shutter types in DSLR photography." Then to have a content specific category, you could create "shutter types." Plan your content so that your content is easy to read and find. As you add content to your website, organize your content immediately. Don't let the article posts pile up, and then several months later decide that you need to organize them. You will have wasted time when the content could have been indexed and found by search engines. Don't use long, difficult terms for your keywords/categories. Although it may be a unique term, using a 20-letter scientific term may not help the general visitor to your website. Keep the category titles simple and easy to remember when possible. Finally, don't use a large number of categories. Creating multiple categories that all lead to one location may make it seem like your website is empty and lacking content. In the WordPress Administrator menu, click on Posts to see the Categories option. Click in the Slug field in order to add the Category Slug. The category slug is a shorthand method used to help quickly identify the category name. The slug is created with lower case letters, numbers and hyphens only. Use the Parent option to add the category to an existing category so that it becomes the sub-category to that category. Leave it as None in order to make the category a parent category. Click in the box and add a Description. This is a description of the category. The description is typically not displayed for a category. However, this may differ between WordPress themes. Click on the button labeled "Add new Category" in order to save and add your category to WordPress. Congratulations you've completed and added a new category to your WordPress site! 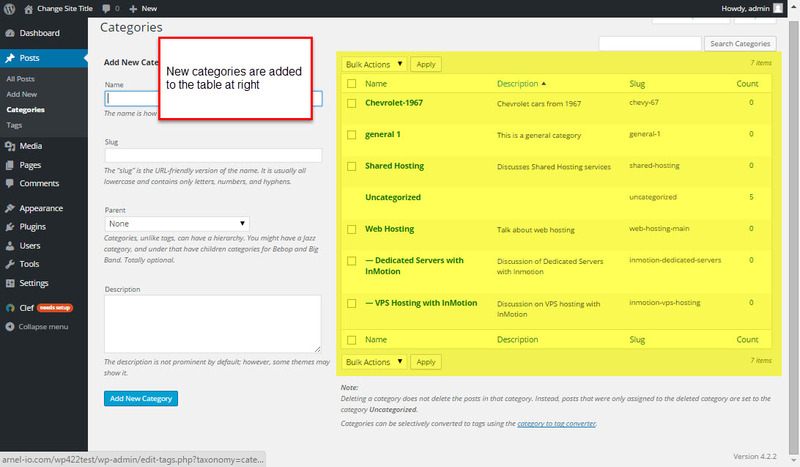 As you add categories to your WordPress site, they will appear in the table to the right of the Categories page.